Hamilton student experiences government program - Hamilton School District. 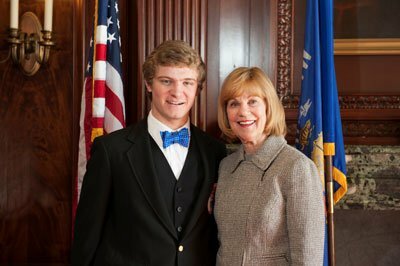 Hamilton High School senior John Phillips completed the Wisconsin State Senate Scholar Program at the State Capitol in Madison. One of only 33 Wisconsin students admitted to the program, Phillips was chosen based on demonstrated citizenship, scholarship and leadership. The application process required him to research and answer questions about Wisconsin’s legislative history, write an essay about a First Amendment legislative issue and submit a resume and letters of recommendation. At the weeklong program Phillips learned from a diverse group of experts, including senators, university faculty, lobbyists, journalists and legislative staff. He engaged in legislative activities by serving as a messenger for Senate floor sessions and committee hearings. In addition, he got a behind-the-scenes look at the Capitol and Governor’s Mansion. He was admitted into the program with sponsorship from Senator Alberta Darling and the State Senate. Phillips is the fourth Hamilton Advanced Placement Government student in recent years selected to participate in the program. Past attendees have included Danielle Barbian, Elizabeth Schounard, Alexander Schultz and Nick Verhaalen.